The title of World Champion has been monopolised by European and South American teams since the inception of the World Cup. However, there have only been 8 different nations that have been crowned World Champions in the 20 editions of the tournament. And from a European perspective, there has only been 5 winners - Germany, Italy, Spain, France and England. Considering their overall participation numbers, has the rest of Europe underachieved? Europe have numerically dominated every World Cup (with the exception of the inaugural event in Uruguay, where for various reasons only 4 European teams made the journey to South America). At every World Cup since 1930, Europe has contributed at least 40% of the competing teams, with a peak of 75% during the 1950s. Given the historical context and the development of football (and FIFA) during the 20th Century, this is perhaps not surprising or even unwarranted. But with the rise of the sport globally over the past few decades and the introduction of the 32 team format for the World Cup finals, is it still justified that Europe provide over 40% of the competing teams? And are the top European teams masking over a level of mediocrity in the confederation's underbelly. The top end of teams in Europe are obviously still amongst the best in the world, but is the 13th best team in Europe more worthy of a place at the World Cup than say the 6th best South American or African team? Would the World Cup benefit from more diversity? Consider the 2014 World Cup. Of the 8 seeded teams, 4 were South American (Brazil, Argentina, Colombia and Uruguay) and 4 were European (Spain, Germany, Belgium and Switzerland). Nominally, these 8 teams would be expected to pass through to the second round with one of the unseeded teams in each group. So of all these unseeded teams, which continent provided the greatest contribution at Brazil 2014? Of the 9 unseeded European teams only 3 made it through to the second round, which was proportionally less than South America, North America and Africa. A similar story occurred in 2010, whereby only 2 of the 8 unseeded Europeans teams made it out of the group phase of the tournament. And this is not even as a result of playing off against each other, as the 8 unseeded European teams were separated into 8 different groups. 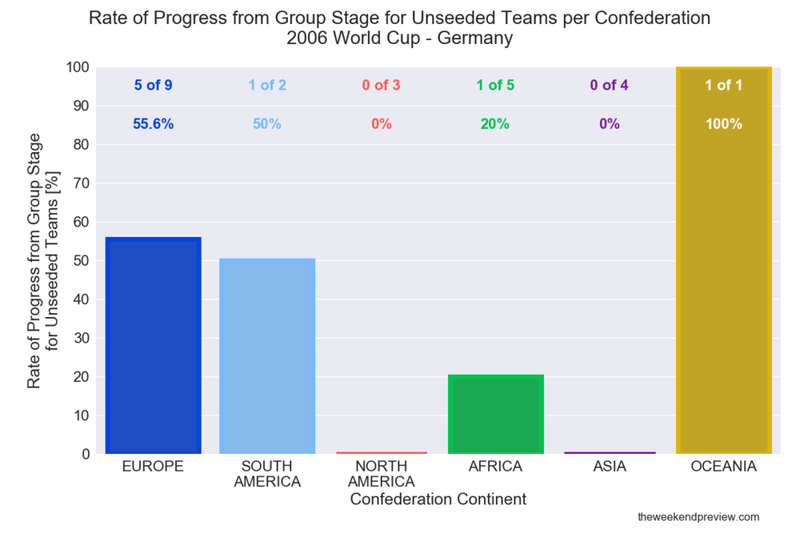 In both 2010 and 2014, both South America and North America provided proportionally more unseeded teams into the second round of the tournament. Hence, based on merit from the last 2 World Cups there is justification that both the South and North American confederations deserve another spot at the World Cup at the expense of Europe. It is true that another entry for South America would mean that more than half the confederation would be able to qualify for the World Cup, whilst for North America (which includes Central America and Caribbean nations) there is a noticeable drop in quality after the top few teams. But even Africa (a large confederation with an even spread of quality) could have grounds to demand an extra spot at the expense of Europe. Although they have never quite threatened to go all the way at the World Cup, the African teams at the very least do provide a greater diversity of playing styles to the competition. But fear not Europe, the timely return of the World Cup to their home continent for 2018 should ensure a return to European superiority and ward off the claims of the other confederations for one of their allocated world cup spots (either that or the hasty expansion to a 48-team World Cup format will make the claim irrelevant). In the first round of group matches at Russia 2018, only 2 of the 14 European teams lost (Germany and Poland) and one of those two (take a guess which) is still expected to make it out of their Group. This level of performance would be consistent with the last time the tournament was held in Europe, Germany 2006, whereby 56% (5 of 9) of the unseeded European teams made it out of their group. As the host confederation, Europe were proportionally the best performing confederation in 2006. Well except for Oceania, which was 1 from 1 in getting to the Second Round of the tournament. Which team was that again? Germany 2006 will bring back happy memories for Australia, even if Tim Cahill is the only surviving member of the squad. Regardless, Australia have arguably saved their best performances at the past 3 World Cups against the unseeded European team in their group. 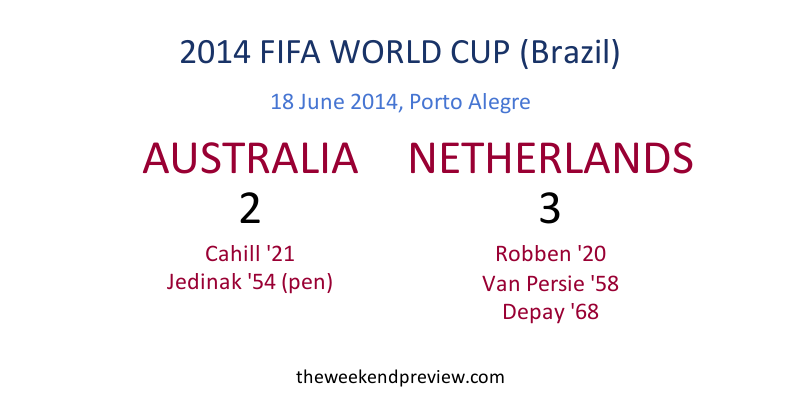 In 2014, Australia threatened the Netherlands, even taking a 2-1 lead midway through the second half before succumbing to the talent laden Dutch side. The Netherlands were certainly an above average unseeded team, proven by their ultimate progression to the Semi Finals. 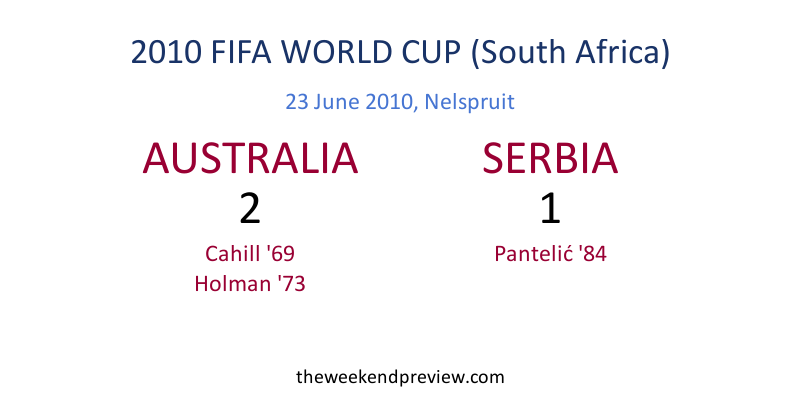 In 2010, whilst chasing a result, the Socceroos managed a 2-1 victory over Serbia, even though ultimately it was not enough to progress further. In 2006, Australia only managed a draw against Croatia, but that was exactly the result they required to ensure progression to the Second Round. So can Australia do it again? Have they saved their best performance for the unseeded European team again? Well they will need to improve from the France game. Although they were defensively solid and prevented France from playing a fluid game style, they still conceded 2 goals, threatened little going forward and most critically lost the opening game, putting them in a difficult situation to escape the group. Australia made only 4 attempts on goal against France. A statistic that will obviously have to change as they take a more positive approach in their remaining games. Although Denmark kept a clean sheet against Peru, they did concede 18 attempts on goal to Peru, which would suggest Australia will get opportunities. But Denmark are also adept at scoring, managing over 2 goals per game during their qualifying campaign. However, it is the game dynamics that presents the most intrigue. A draw would nominally favour Denmark, but with their last game against France they would prefer a win against Australia to confirm progression to the Second Round. Australia could still progress with a draw, but their fate would then not be entirely in their own hands, even if they beat Peru in the last game. So this should ensure there is controlled aggression from both teams as they try to establish an advantage in the match. But as a loss is not an acceptable option for either team, as soon as one team concedes there should be an immediate aggressive response from the other team in search of an equaliser. This should ensure goals, just that I fear from an Australian perspective that the Danes are the better team.